Hypnosis is an incredibly effective tool for public speaking phobia, because it gets to the root cause of the problem very quickly. In this day and age many companies require their employees to run meetings, lead training courses and deliver presentations in front of large groups of people. Many of my clients feel frustrated that they can’t advance in their careers because they are afraid of speaking in public; this fear really holds them back. If this is you, never fear! You can conquer your phobia and reach your highest potential both personally and professionally with the help of a clinical hypnotherapist. The thought of speaking in public drives fear into the heart of even the most brave and stoic among us. Why is it that we make such a big deal about this? After all, it’s just a bunch of people like you, right? The logical, rational part of you knows there’s nothing to be afraid of. You may even be beating yourself up for feeling this way. Actually logic has nothing to do with it; your fear is driven by your subconscious mind, and it marches to the beat of its own drum. Deep down inside of us, there is such a strong need to belong that our fear of rejection often takes over to the degree that we become unnecessarily fearful of putting ourselves in any situation where we may face the possibility of rejection. Long ago, in times when we hunted and gathered in groups of one hundred, we needed to belong to a clan in order to survive. This instinctual survival mechanism is built into your DNA and that is why today, the need to belong is so strong. Sometimes that instinctual need takes over in ways that do not allow us to be the best we can be. 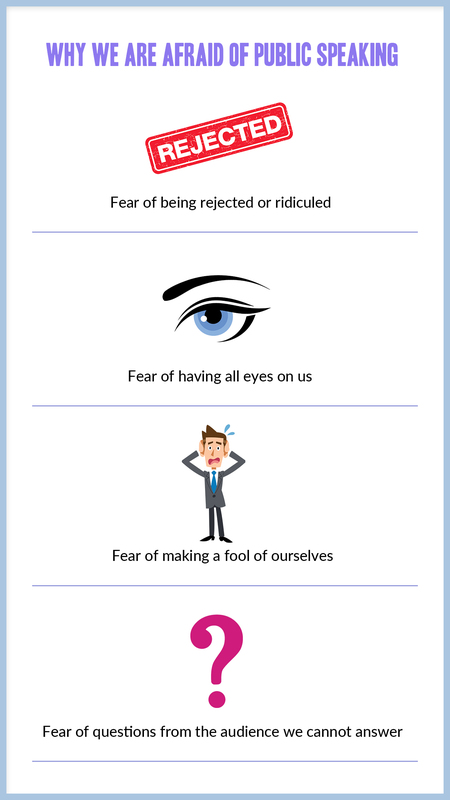 The two most prominent factors that feed your public speaking phobia are fear of rejection and fear of being judged. Most of the time, in fact nearly all of the time, you don’t need these fears; yet they come out in full force at exactly the time when you want them to go away! It is possible to overcome these irrational fears by overriding the automatic subconscious response. You can do this by working with a qualified hypnotherapist. Your therapist will work with you to uncover all the unwanted beliefs and behaviour patterns you have developed since you were born that are feeding your phobia. Once she finds them, then with your permission she can help you eradicate them by working directly with your subconscious mind. Many of my clients have successfully beaten their fear of speaking in front of others and gone on to receive promotions, enjoy very successful careers and increase their confidence in every area of life. The average number of sessions required for this issue is around three sessions. If you would like to use hypnosis for public speaking, feel free to contact me any time.